I must admit that I love the beach. When I eventually stop my travels, getting a place near the beach so that I can walk along the shore on a daily basis is something that I would love to do. There is simply something incredibly intriguing on how beaches change with each storm and all of the wonderful things that can be found while wandering the beach (obviously this doesn’t include the increasing amount of trash and plastic). It’s always great to hear about businesses that get behind national parks and help support the goals and efforts of the national park system. One business that supports national parks on a regular basis is Nature Valley and I think that they deserve a little shout out of appreciation for taking a lead in supporting the national park system. One of the essentials that I take whenever I hike are snacks because I never know when a short hike will turn into a much longer journey as I wander national park trails. 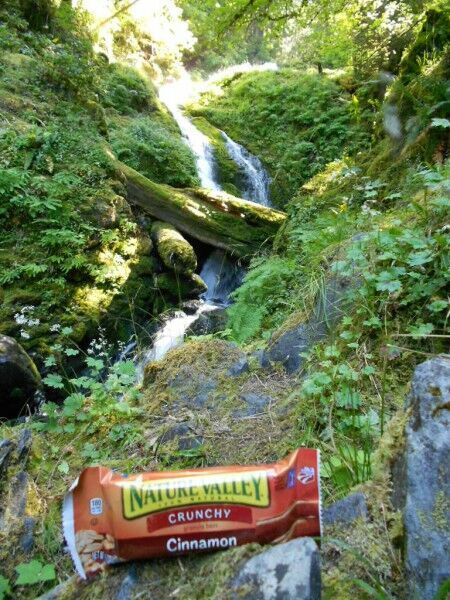 One of the snacks that can often be found in my backpack are Nature Valley granola bars. On a recent trip to Olympic National Park, I stopped by a waterfall in the Fletcher Canyon area of Quinault Valley. As I placed my backpack down, I reached my hand inside and pulled out a snack. I decided that it would make a nice “thank you” photo in hopes of encouraging Nature Valley to continue their support of our national parks, and hopefully encourage other businesses to support them as well. One of the largest parks in the continental United States, the Olympic National Park consists of over 900,000 acres of pristine wilderness, and has more than 2,000,000 visitors every year from around the world visiting its wilderness beaches, temperate rainforests, old growth forests and alpine peaks. The park is also an International Biosphere reserve and World Heritage Site due to its unique composition. 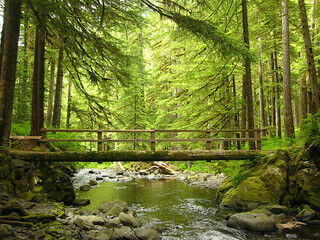 The Olympic National Park can be thought of as consisting of four different sections – the Pacific coastal areas, the western Olympics that contain the Hoh Rain Forest and Quinault Rain Forest (the only rain forests in the continental U.S.), the northern Olympics that lie along the Strait of Juan de Fuca and Lake Crescent, and the eastern, drier section of the park that contains typical western U.S. old growth forest. 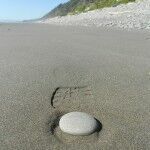 Cape Alava Loop: Wilderness beach hiking is one of the rare treats you can do in the Olympic National Park, and the Cape Alava Loop gives you this in spades. 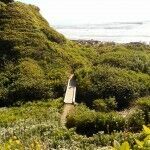 The 8.8 mile loop starts in the coastal forest but quickly emerges on the sandy and rocky beaches of the Washington coast, affording hikers with tidepools, sea caves, rocky monoliths, and the wonderful sounds and smells of the ocean. 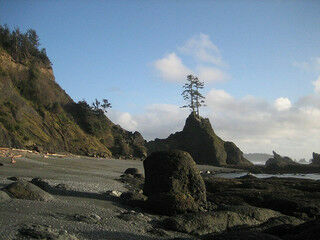 The Cape Alava Loop can be completed in a day, but camp for the night for an unmatched sunset and morning. 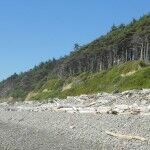 Shi Shi Beach and the Point of the Arches: Considered one of the most beautiful beach trails in the region, this area was one of the last to be added to the Olympic National Park in 1976. 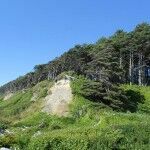 The trail begins in the coastal rain forest, winding through Sitka spruce and rain-soaked bogs before winding down a steep bluff to Shi Shi Beach. The amazing beauty of this wilderness beach is evident as the trail heads toward Point of the Arches, a long stretch of beach crowded with sea stacks and rock arches. The round-trip takes you 8 miles, with a total elevation change of only 200 feet. 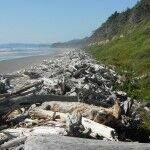 Hoh River: Possibly the busiest location in the Olympic National Park, the Hoh attracts busloads of tourists from Seattle and around the world each summer, and with good reason. 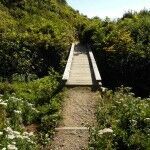 Hike the easy trail to Five Mile Island to witness some of the most amazing scenery in the world – the path winds through old growth rainforest on this 10.6 mile round-trip, and the sheer volume of birds and flora is mind-boggling. 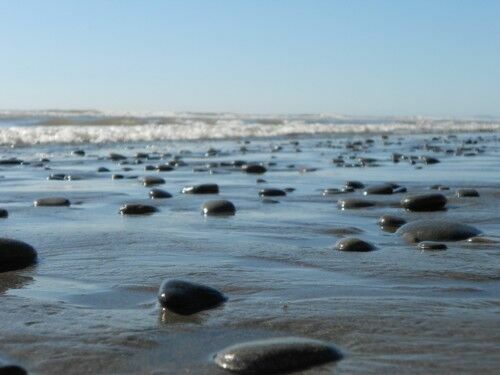 Though crowded, the Hoh River is one area you can’t miss. 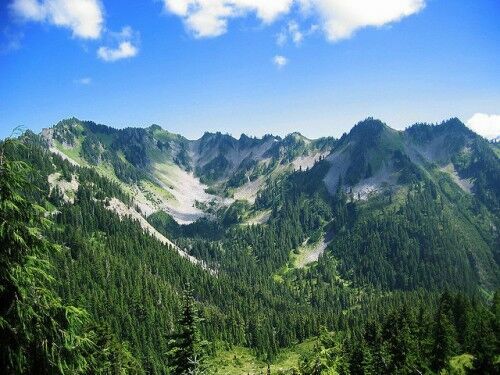 Pete’s Creek: This steep and rough hike thankfully ends with a wonderful payoff – the top of Colonel Bob Peak, at 4500 ft towering above the rainforest-filled valleys below, and offering stunning views of Mount Olympus, Mount Rainier, and Lake Quinault. The 8 mile round-trip hike gains almost 3300 ft in elevation, stepping over rocky creeks, crossing avalanche slopes, and straddling basalt cliffs. But it’s worth it. 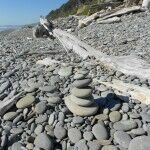 Elwha River: The Elwha River is the most important river in one of the largest tracts of old growth forest left in America, and the Elwha River hike takes you through the heart of the area. The Elwha River trail thankfully bypasses the Grand Canyon of the Elwha (which is as steep as it sounds) and continues on for nearly 5 miles through the Olympic interior, affording the wonderful sights of wildflower clogged slopes and fern and moss speckled rocks throughout the hike. Grand Ridge: One of the highest and most scenic hikes in the Olympics, Grand Ridge is either a short and awesome 5-mile round-trip hike, or a brutal 15 mile out and back haul that few can make. Thankfully the 2.5-mile jaunt to Elk Mountain reaches the highest point on Grand Ridge, and gives hikers a seemingly never-ending view of the glacier-covered Olympic Mountains – at a height of 6600 feet above sea level, you can see from the Strait of Juan de Fuca to Mount Olympus. 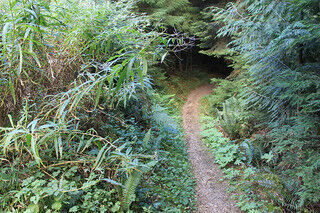 Spruce Railroad Trail: An easy 8-mile round-trip along the shores of Lake Crescent, the Spruce Railroad Trail is also one of the few trails in the Olympic National Park to allow mountain bikes. The breathtaking views of Lake Crescent are incredible – the lake is 9 miles long and over 600 feet deep, and the waters are amazingly clear. On a nice day you can see nearly 50 feet into the depths of the lake. Big Quilcene Trail: One of the great trails on the dry side of the Olympic Peninsula, the Big Quilcene Trail is a somewhat steep 10.6 mile round-trip that climbs about 3500 through the steep valleys and peaks of the Buckhorn Wilderness. The trail ends at Marmot Pass, affording survivors with amazing views from the 6,000 foot elevation. 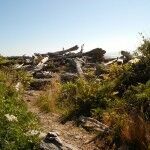 The Big Quilcene Trail is one of the best hikes in the Olympics, with wonderful old growth forest, a crystal-clear river, alpine meadows, and the amazing views from Marmot Pass at the end. Upper Dungeness River: One of the most beautiful (and easiest) wilderness trails in the Olympics, the Upper Dungeness River Trail never gets too far from the river, always allowing peeks at its crystal-clear water. 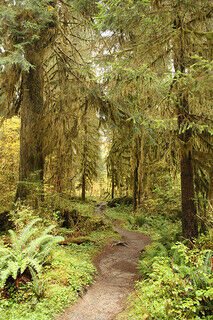 The trail ends at Camp Handy, situated in a lovely meadow surrounded by old growth Douglas Firs. 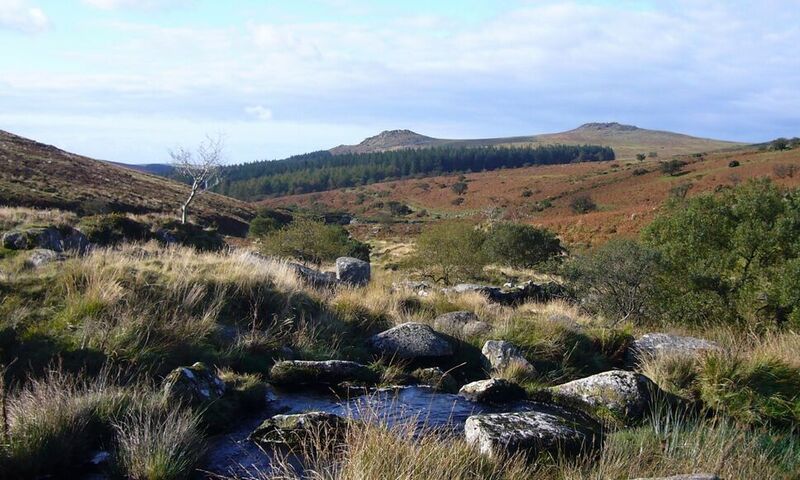 This is a perfect trail for the young and the new to hiking. Randall Pinkston is the founder and editor of Neotravel.com Travel, a travel deals aggregator based in Seattle, USA – you can also find them on Facebook and on twitter @neotravel. When not traveling, Randall is most likely thinking about where to travel next. 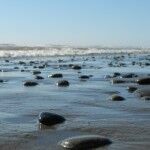 Scientists at Olympic National Park have only a small window of time to study intertidal communities, the turbulent meeting place between land and sea. In order to work at the lowest summer tides, they often wake at 2AM and hike in the dark to the Pacific coast. This is a place of rich biological diversity, fierce competition, and strong indicators of a changing climate.